Let me tell you this..Mamarazzi is book mad. Last night she finished this book in one sitting. I slept. I woke up. I slept again. Mamarazzi was still burning midnite oil or is it electricity now?. What's so good about this book ah? 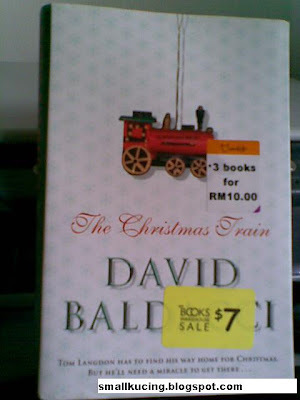 Mamarazzi got it from one of TIMES BookStore Warehouse sale at RM10 for 3 books. Hardcover. She said this book very "Kan Cheong". Got mystery, got romance, got near tragedy and got comedy. About this fella Tom Langdon who is a writer had to ride a train to L.A coz he was banned from flying coz he lost his temper at the airport Securities. On the train he met with all sorts of people. And very unexpectedly, he met his old flame which he still carry a torch for. Then there is this weird lady Agnes Joe which everybody seems to know. A young couple who runaway from home to get marry on the train despite their parent disapproval of their marriage. There is one very obnoxious lawyer on board who likes to make people's life miserable. And there seems to be a thief on board of the train. There is also a famous movie director on board and decided to join venture with Tom to make a movie about train rides and sponsor the young couple's wedding. Also Tom's current girlfriend show up just when Tom and his old flame were going to reconcile. Huh...then there was this BIG avalanche which trapped the train in a very dangerous mountain side. Wah....all very "Kan Cheong". A very worthy buy. Thanks for leaving a comment in my blog post blog displayed in different browser. I have responded to your comment.